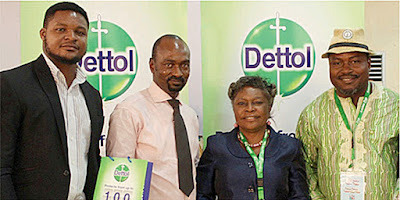 In line with its commitment to pro¬tect and educate consumers on the dangers of buying and using cheap substandard product, Dettol, one of the leading antiseptic brand from the stables of RB has further strengthened its partnership with the Nigerian Medi¬cal Association (NMA) at the associa-tion’s 55th Annual General Conference held in Ibadan. Speaking during the conference, the Marketing Director, RB West Africa, Silivrili Oghuzan, said Dettol is most delighted to further strengthen our part¬nership with the Nigerian Medical As¬sociation to further promote safety and good health. He further explained: “Dettol has been consistently partnering with statu¬tory bodies within the health sector in¬cluding NMA, Ministry of Health, NAF¬DAC and local governments to educate consumers about the best hygiene prac¬tices and contribute to the health and wellbeing of families in Nigeria for the last 50 years.” Silivrili said Dettol’s on-going cam¬paign is focused on educating Nigerian families about the need for good stand¬ard protection against germs. “We see in markets newly introduced sub-stand¬ard, non-certified antiseptic and mainly imported products which does not de¬liver the optimum germ killing benefit to the Nigerian families”. “You cannot take the risk with your loved ones at the end of the day, half protection is no protection, so if your an¬tiseptic liquid does protect you and your family completely. Low price is not good enough reason to buy substandard solu¬tions, cheap products might not always be a better option considering the risk that some of the consumers are taking. Dettol is 10 times better in killing germs compared to other brands in the market and is the only proven brand killing 100 illness causing germs,” he said. Speaking at the conference, member, Global Hygiene Council, Dr. Nneoma Idika who made a presentation on be¬half of Dettol commended Dettol for its initiative geared towards ensuring fami¬lies around Nigeria are not exposed to the possible detrimental effects of using substandard and non-certified products. “To overcome the health challenges posed by usage of substandard and non-certified products she called for an all-inclusive effort. “Intervention strategies including private public participation such as championed by RB in the ‘Anti-Cheapie’ Campaign against suboptimal foods, drugs, antiseptics, cosmetics in Nigeria are highly recommended. For improved healthcare delivery in Nige¬ria, proper coordination of burning is¬sues by stakeholders will be necessary,” she said. She added that “Dettol has being creating awareness on the detrimental effects of using cheap and substand¬ard non-certified products in the Nige¬rian market highlighting the Influx of imported, cheap, non-certified health products most especially drugs, foods, cosmetics, antiseptics and disinfect¬ants in the market that consumers are exposed to with a campaign with em¬phasized the slogan “Bitterness of poor quality remains after the sweetness of low price is forgotten”. During his address, the Chairman Local Organising Committee, Dr. Ba¬batunde Olatunji said the theme of this year’s NMA conference “The Nigerian health sector: current trends, burning Issues and what the future holds” is aligned with the current happening in the nation’s health sector and possible panacea to achieve a robust health sector. This story was published in Newswatch Times on May 28, 2015.